By far one of the most popular and common herbal tea options out there, Celestial Seasonings Fruit Tea is nonetheless a great choice. They are easily found in nearly every grocery store and the sampler provides a great selection of tea for any occasion. They currently have a 4.6 rating on Amazon, and many different selections to choose from. So what makes this brand so widely liked? Because different teas can help with different situations, it is always a great idea to grab a variety pack. 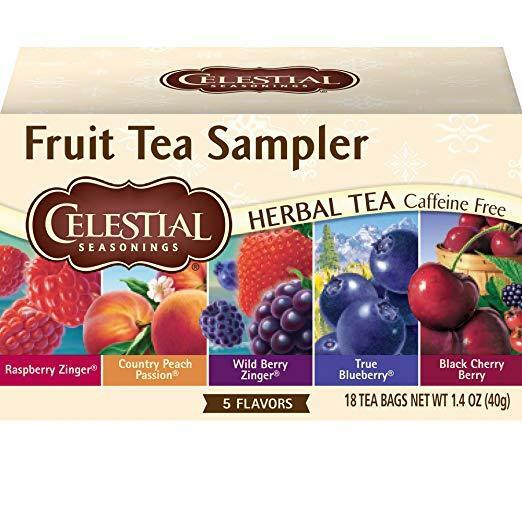 Celestial Seasonings Fruit Tea features 18 tea bags, with 5 of their most popular flavors for you to choose from. Each and every tea is made with all natural ingredients, and absolutely no artificial additives. I am actually very fond of this tea and currently have this exact box in my cupboard. So from personal experience I can say that this tea is not only delicious, but the variety pack offers a great selection to choose from. Now, because this is a variety pack, each flavor of tea will have different ingredients. However, none of the teas featured in this sampler, or any other tea from this brand, contain any artificial additives or preservatives. Raspberry Zinger: Hibiscus, rosehips, roasted chicory, orange peel, blackberry leaves, natural raspberry flavor with other natural flavors, raspberries and raspberry leaves. Country Peach Passion: Orange peel, rosehips, hawthorn, chamomile, natural peach flavor with other natural flavors, blackberry leaves, hibiscus, peaches, citric acid and paprika (color). Wild Berry Zinger: Hibiscus, rosehips, roasted chicory, orange peel, blackberry leaves, natural flavors of black raspberries, strawberries, blueberries, red raspberries, cranberries and cherries with other natural flavors and citric acid. True Blueberry: Hibiscus, rosehips, orange peel, natural blueberry flavor with other natural flavors, blackberry leaves, wild blueberries and blueberry leaves. Black Cherry Berry:Hibiscus, rosehips, roasted chicory, blackberry leaves, hawthorn, natural black cherry flavor with other natural flavors, chamomile and sweet cherries. Each of the teas do contains rosehips, which are great for the immune system. This is because they contain a high level of vitamin C. In addition, they can also be used to help detoxify the body. The rest of the ingredients in Celestial Seasonings Fruit Tea are various fruit and citrus herbs, which contain a lot of antioxidants. So if you want to boost your immune system, these teas are what you need. Herbal teas in general have a lot of great benefits to them. Regardless of the type of herbal tea you are drinking, there are somethings that you will be take advantage of. One benefit that you will get from all tea is weight loss. Now, this is not like the tea will burn off fat. Rather, the best herbal tea will remove water retention, so you will visibly look slimmer because you will lose a lot of your excess water weight. Another great thing about herbal tea is that you get a access to a wide variety of antioxidants, vitamins, minerals, and other nutrients. Because herbal tea often features a combination of herbs, you are able to take in a variety of great things that can be highly beneficial to your body. Other common health benefits of the best herbal tea include relaxing the body and mind, aiding in sleep disorders, reducing inflammation, easing various pains, protecting against common diseases like the cold or flu, boosting immune system, regulating the digestive system, and stimulating cognitive function. Celestial Seasonings Fruit Tea are great at boosting your immune system. The rosehips and various fruit herbs they include contain a lot of antioxidants and vitamin C, which is sure to give your body the boost it needs. While no product is perfect, Celestial Seasonings Fruit Tea gets really close. There is a reason that Celestial Seasonings is one of the most popular herbal tea brands on the market. They are not only inexpensive, but they actually deliver very well. Each sampler comes with 18 tea bags, evenly distributed between 5 flavors. This gives you the opportunity to try out whichever flavor you want and keeps the experience fresh in the meantime. Plus, it allows you to try out a bunch of different flavors, so you can find a favorite. Or you can just stick with the various variety packs they offer. Pretty much, the only downside I could find for this product was the title on the product page is a bit misleading. It does say that you are ordering a pack of 3. However, various customers have mentioned that they only received 1 box of tea, and not three. Now, this may just be a mix up, or the pack of 3 may just be a misleading statement. Either way, it is something to look into if you are considering picking up a box for yourself. Celestial Seasonings was started in 1969. One of their founders, Mo Siegel, started the company after making a tea out of handpicked herbs from the Rocky Mountains. After selling tea to various health food stores, and introducing their flagship blends, "Red Zinger and Sleepytime", Celestial Seasonings took off. Now, they serve more than 1.6 billion cups of tea a year. They have a wide selection of teas available in nearly every grocery store, on their website, and of course on Amazon. All of their ingredients are natural and contain no artificial additives or preservatives. The sampler offers a great selection of fruit teas for under $10. Rosehips and the various fruits that Celestial Seasonings Fruit Tea include in their tea are great for boosting your immune system. The title may be a bit misleading, as many have reported not receiving their whole "pack of 3", and only getting 1 box. Celestial Seasonings Fruit Tea is an incredibly popular brand and for good reason. The majority of the critical reviews around this product are from people who simply did not like the taste for their own personal preference. None of them had anything to say about the quality of the product. If you are looking for a near perfect tea brand, this is it. The only thing that could make Celestial Seasonings Fruit Tea even better is if their tea ingredients were also organic. Overall, Celestial Seasonings Fruit Tea is a great brand that you will not regret buying from. Their ingredients are high quality and offer some great health benefits. If you want to try them out for yourself, you can grab the sampler for $7.47. For more information about the best herbal tea, check out the rest of Green and Growing. Here are some top questions that I found for people seriously considering buying the Celestial Seasonings Fruit Tea. What kinds of tea flavors are in the box? Contains: 1 box each of Cinnamon Apple Spice, Lemon Zinger, Mandarin Orange Spice, Peppermint, Devonshire English Breakfast, & Victorian Earl Grey. Are the tea bags individually wrapped or loose in the box? Each flavor has a foil packet with 3 to 4 teabags.